The El-Hibri Foundation welcomed President Barack Obama’s visit to the Islamic Society of Baltimore today, where he delivered a speech surrounded by local and national American Muslim community leaders. The visit marked an historic occasion as his first visit to an American mosque during his presidency. "You fit in here. You're not Muslim or American, you're Muslim and American… Remember you are not alone. Your fellow Americans stand with you." - Dr. Suzanne Barakat, chair of Our Three Winners Fund, established in memory of her brother Deah, his new wife and his wife’s sister, who were murdered in a hate crime in Chapel Hill, NC last year. The organization funds education, dental relief, and service projects helping those in need. Dr. Barakat is also a resident in family medicine at San Francisco General Hospital. - Rami Nashashibi, executive director for almost 20 years of the Inner-City Muslim Action Network (IMAN), a Chicago-based community organization that fosters health, wellness and healing in the inner-city by organizing for social change, cultivating the arts and operating a holistic health center. - Saafir Rabb, CEO of InterCulture, a Baltimore-based consulting firm that assists businesses with cultural competency. His career has led him to affect change in sectors from business development and job creation to drug treatment and affordable housing. 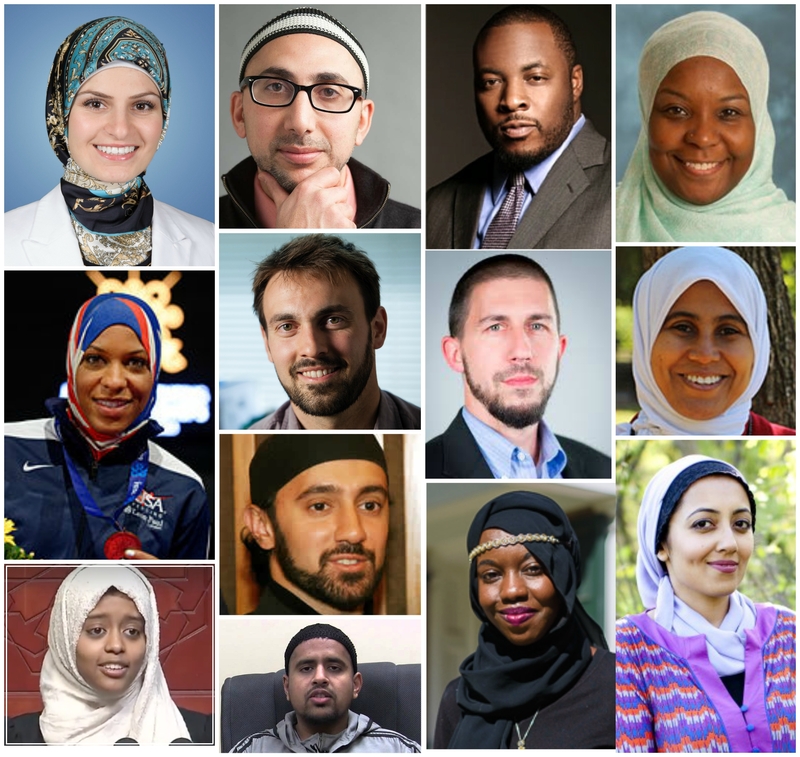 - Kameelah Mu’min Rashad, chaplain at the University of Pennsylvania and founder of the Muslim Wellness Foundation, which works to reduce stigma associated with mental illness, addiction and trauma in the American Muslim community. - Ibtihaj Muhammad, a professional fencer who will soon become the first woman in hijab to compete in the U.S. Olympics. The President said in his remarks: "I told her to bring home the gold. Not to put any pressure on you." - Colin Christopher, executive director of Green Muslims, a national resource in the Muslim community for spiritually-inspired environmental education, reflection, and action. - Dr. Edmund Tori, advisory board member, and Imam Yaseen Shaikh (pictured at the bottom, second from the left), resident scholar, at the Islamic Society of Baltimore, where President Obama delivered his remarks. The Islamic society was founded with a mission of service and compassion and is home to a school, seminary, and free health clinic, among other services. - Khadija Gurnah, founder of Project Ejaba, an online resource dedicated to helping Muslim young adults with the many questions they ask about finding ways to live authentically, at a time when many feel under pressure to respond to the many misconceptions about Islam and Muslims in America. In 2015 she was honored as a White House Champion of Change for her work with American Muslim Health Professionals’ (AMHP) on Affordable Care Act outreach and enrollment efforts. - Sabah Muktar, a University of Maryland - Baltimore College student who is studying to be a doctor. She had the honor of introducing the President. - Khalid Latif, executive director and chaplain of the Islamic Center of New York University and a chaplain for the New York Police Department (NYPD). - Emtithal Mahmoud, a Yale University student and the 2015 Individual World Poetry Slam champion, who now travels on behalf of Poetry Slam inc. (PSi) to teach poetry to others, hoping to inspire them. - Sarah Jawaid, a community organizer with LA Voice, a faith-based non-profit affiliate of the PICO National Network, where she works on policy change for affordable housing issues, economic opportunity, and criminal justice reform—the most recent win being the passage of Proposition 47, a state-wide ballot initiative to redirect money from prisons to schools.